She discovered him unmoving and underwater. But Sarah Scruggs was determined to nurse a baby squirrel caught adrift in South Carolina's recent floods back to life. Sarah Scruggs on Instagram: "Poor baby squirrel was lying in a puddle :( :( too much rain for everyone." "I had gone out to see what damage there was in the neighborhood and I walked by and saw something," Scruggs told ABC News. "There was a little baby squirrel not moving but bubbling and sitting underwater." 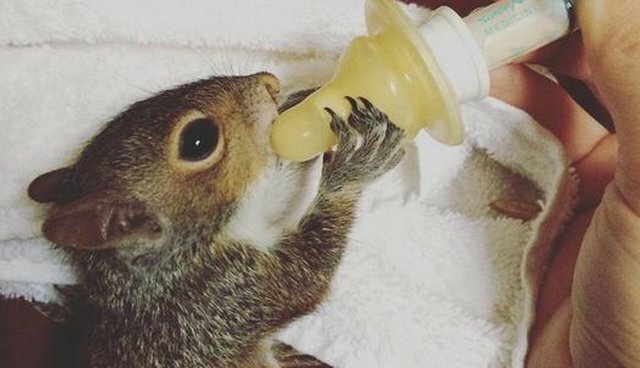 After Scruggs took him in, as her Instagram account shows, Scruggs quickly came to adore the little squirrel, who she's named Arthur. Photos document how Arthur nurses (with both paws on the nozzle) and how he sleeps (curled up in a little ball). Sarah Scruggs on Instagram: "Zonked out"
Despite her obvious love for the little squirrel, she doesn't plan on keeping him as a pet - for his own good. Sarah Scruggs on Instagram: "Alive and curious"
"I want him to be able to jump and climb and have squirrel buddies," Scruggs said. "I'm hoping he will transition back to his habitat well." And the tender, loving care Scruggs is giving to Arthur seems to be working wonders. Sarah Scruggs on Instagram: "Doing so much better :) ð²ð"
Sarah Scruggs on Instagram: "Morning dose of cuteness, rehydrating Arthur"
Sarah Scruggs on Instagram: "Thank goodness for my SOT hoodie"
We're so glad Arthur's in good hands. Contact your local department of natural resources if you see an animal in need of help.